These days there are fewer people asking for natural stone tile for their kitchen or bathroom renovation. However, it does still hold some popularity and I think it is worth going over some of the basics of stone tile for those of you who are considering it. Most of my comments relate to all stone tiles but there are some stone tiles that will be less permeable to moisture and scratching than others. 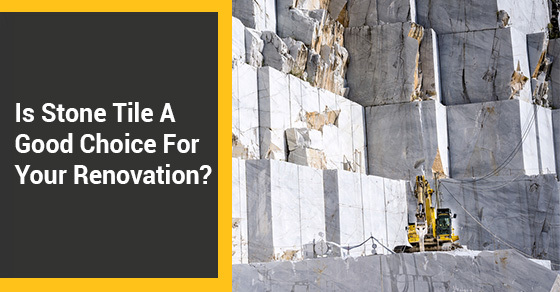 There is generally a gradient with soft white marble being at one end of the scale and hard granite at the other so you need to be aware of these differences when considering your choice. The bottom line with all stone products is that they are found in nature and nature gives us the characteristics inherent in them. Fabricators and installers can attempt to change some of these characteristics but essentially it is an uphill battle to try and change the natural characteristics of stone. So, part of your acceptance of stone tile will depend on your attitude. When you see an old marble countertop that has all sorts of nicks and scratches and stains on it do you consider it a disaster or do you see the beauty in it and consider it to have a lovely old patina? Do you like crisp clean lines or do you like the look and feel of something that is aged. For the most part these days, kitchen and bathroom design incorporates the crisp clean look over the older softer look but that is a current trend rather than an absolute. This may change in time. If you like that crisp clean look and, most importantly want to maintain that crisp clean look over time, then my suggestion would be to avoid natural stone or at least the softer natural stone. Because even if it looks great for the first year or two, in time it will start to show its age. Know that it will absorb moisture water and other liquids. Sure, this can be reduced by putting a good sealer on the stone, but it won’t eliminate the problem. In a tub or shower area the stone can absorb water and then migrate down to the bottom few tiles so that you have a darker band where the tile meets the tub or shower floor. This is difficult to eliminate because it can take weeks to dry out and people generally don’t want to wait weeks to have a shower. And if it does dry out the process of being saturated with water begins to occur all over again. Dropping an acid on stone will etch it. This is to say that it will eat the stone away and create a rough patch or area. This area would need to be buffed or polished out to correct the problem. There are a surprisingly large number of acidic products that you may not realize are acidic. Natural stone is easily stained by a vast number of household products. Regularly sealing the stone will reduce its porosity and thereby reduce the chance of staining. Yellowing of light coloured stone can occur due to naturally occurring iron oxidizing within the stone. There really is nothing you can do about this because it is embedded in the stone. Some people may consider it a patina….some people not so much. Water spots can occur when hard water evaporates and leaves mineral deposits behind. These marks are generally difficult to remove as they are embedded in the stone. So there you have it. 5 characteristics of natural stone that may or may not drive you crazy. There is a good link to this subject on the Houzz website. Pay particular attention to the comments section in the link because you can learn a lot from other peoples’ experiences. My opinion is that stone, particularly with the softer and lighter coloured stone, should really only be used on bathroom floors and not in wet areas such as tub and shower areas. Even then you should consider the usage of the bathroom. If there are children and pets in the house this would increase the chances of things going wrong with your tile. When we see pictures of bathrooms wrapped in the softest, whitest marble in magazines and online I sometimes wonder if we are looking at either brand new bathrooms or show piece bathrooms that are rarely used. It is important to balance looks with practicality in all of your decisions regarding your renovations. The good news in all of this is that you have now become knowledgeable about stone tile and, with the help of your contractor, you can make your own educated decision as to whether natural stone is correct for your application. There are often no right or wrong decisions here but rather the best decisions are often simply based on facts and knowledge and how they relate to your particular situation. Finally, I just want to say that for those of you who want the natural stone look without dealing with the characteristics of natural stone, there are hundreds of porcelain tiles out there that mimic natural stone incredibly well to the point where I have to touch and feel them to see what they are actually made of.